– Two-thirds of home fire deaths result from fires in homes without a working smoking alarm, according to the National Fire Protection Agency (NFPA). I.A.F.F. Local 1293 fire fighters remind you to not only change your clock for Daylight Savings Time but the batteries in your smoke alarms, too. 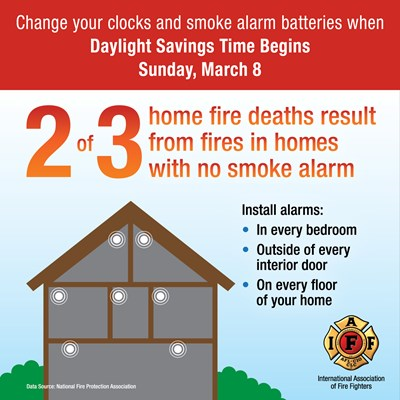 “Saving your life can be as simple as changing your smoke alarm batteries once a year and replacing smoke alarms every seven to 10 years,” says Local spokesperson David Riggs, a fire fighter at I.A.F.F Local 1293. Special smoke alarms are even available for those who are deaf or hearing-impaired. Your local fire fighters recommend installing a dual purpose smoke alarm in every bedroom, outside of every bedroom and on each floor of your home. “You should also install carbon monoxide alarms in your home and check them once a month,” says David Riggs. Carbon monoxide fumes are poisonous and will increase the intensity of a fire if ignited. More than 2,300 people die each year in home fires. Having a smoke alarm and carbon monoxide alarm that works 24 hours a day greatly increases your chance of survival if your home catches on fire. Previous: Business as Usual ?